Here is my finished skirt. It’s very girly-twirly and fun. Like I said before, I used the Sew Mama Sew Tutorial, which was great. I just couldn’t get the shirring to work on the waist band so I made a straight band with zipper and it worked out well. I used lots of fabric to make the skirt extra gathered and twirly – about 3 times the lower waist circumference. 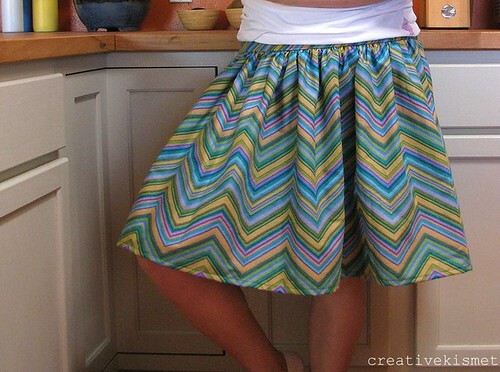 I have a similar skirt that I love that has pleats instead of gathers I may try to make that next. This entry was posted in Clothing, Sewing and tagged clothes, Sewing, skirt. Bookmark the permalink. Love it! Want one just like it… I’m inspired! Great fabric choice too! SO cute! what fabric is that!? So cute! This makes me want to make a skirt using this tutorial, too.